The main floor living space flows from living, to kitchen, to dining, to patio with lots of light. The City Steps from 21st Street. Our first buyers won in a multiple offer situation and were a day away from closing. Sometimes life happens ¯\_(ツ)_/¯ this sweet pad is now available again! Welcome to the City Steps condo community! This clean townhouse neighborhood built with environmental sensitivity sets you in the heart of Tacoma’s revitalization. Crafted in a modern style with tall ceilings and double-insulated walls on the slope above Downtown, this home offers comfort and quiet in a lively urban setting. Whether you're walking, cycling, driving, or taking the bus, this location is the sweet spot. Pull your car out of the tandem garage and reach Wright Park, the Zodiac Supper Club, Alma Mater, St. Joseph Medical Center, or Tacoma General Hospital all within 5 minutes. Or, head out the door on foot to reach the University YMCA, 7 Seas Brewing, UW Tacoma, or The Swiss Pub, within 10 minutes. We could go on and on about what's nearby in Hilltop, Stadium, and Downtown (and we will!) but let's take a look at this townhouse first! In traditional townhouse design, this home is built on 3 levels: an entry and parking level, living and dining level with a patio and half bath, and at the top a quiet, private floor where you'll find vaulted ceilings, a spacious landing (lit by a skylight!) perfect for an office or additional sitting room, a bedroom and separate full bath, laundry, as well as a lovely suite featuring a larger bedroom and second full bath. There's a lot more to say about this home, and much more to see. Continue on for the video tour, photos, neighborhood highlights, and more details about this townhouse at City Steps. Enter at ground level beside your tandem garage (or step in through the door from the garage itself), set your shoes in the tiled foyer, hang your jacket in the closet, and head up the carpeted staircase. You'll find a half bath with a pedestal sink conveniently located at the top of the stairs. This is perfect for anyone dropping by for a visit. Ground floor entrance and 2 car tandem garage. 1/2 bath at the top of the stairway to the main floor. On the main floor enjoy the open living space flowing seamlessly from dining to kitchen to cozy fireside family room. And don't forget the private patio just outside the sliding glass doors from your dining table. 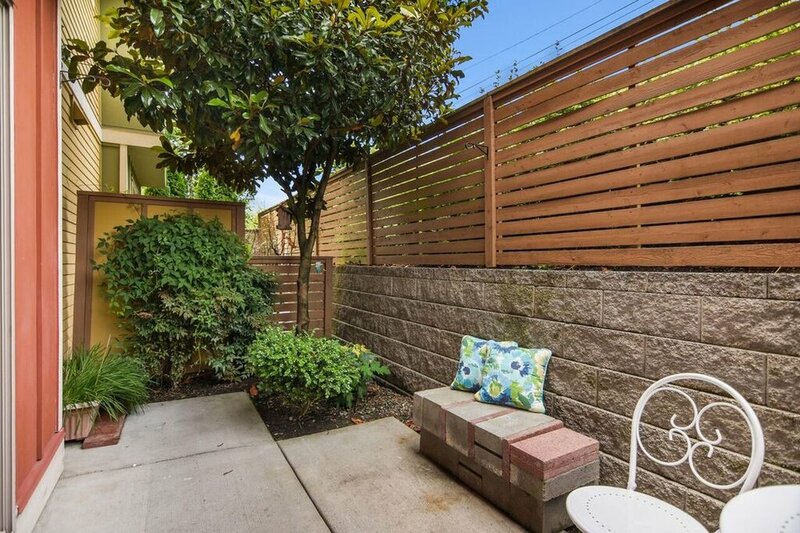 Fenced, paved, and landscaped, this is a pretty little outdoor oasis. The kitchen features stainless appliances, gas stove, granite countertops, island and bar counter. Step right out from the kitchen and dining area to this private patio with a magnolia tree, shrubs, and flowers. The patio is paved, fenced, and ready for your umbrella and chairs. Use the sliding glass doors from the dining area to step outside. In the kitchen, bring linens and decor of any color to compliment the stainless appliances. Cook on the gas stove, while friends or family pull a stool up to the bar counter lit by a triple pendant light fixture. Pull a chair up to the bar counter under the triple pendant lights and chat with the cook. Ample cabinets and a wonderful layout for casual entertaining with this kitchen island as prep space or buffet. A big window in the living room lets in lots of natural light. Or, pull those curtains closed and light the gas fireplace for a cozy evening. Consider some custom built-ins on either side of the hearth for books, or leave it simple; the rooms are ready for you. The gas fireplace is ready to keep you cozy in the living room with its tall ceilings. A big front window, and space for area rugs to make a statement. Get lots of light from the windows, or pull the curtains for a cozy fireside evening. Head on up the second staircase to the top floor with its vaulted ceilings, skylight, and a truly spacious landing area. You'll find a bedroom just right for guests, family, or even a roommate with a full bath just outside the door. Across the landing is the private suite with its walk-in closet, and an oval tub in the full bath. Set up the landing space as an office, a cozy reading nook, or a little library. This level also includes a washer and dryer ready for you in the laundry space. The top floor suite has vaulted ceilings and a beautiful big window. Included in the suite is a walk-in closet and full bath with washer & dryer just outside the door in the landing area. Oval tub and vanity with both cupboards and drawers in the suite's full bath. This large landing space on the top floor is lit with a skylight in the vaulted ceiling. This could be your additional sitting room, an office, or reading nook. The second bedroom on the top floor is perfect for guests or family members. 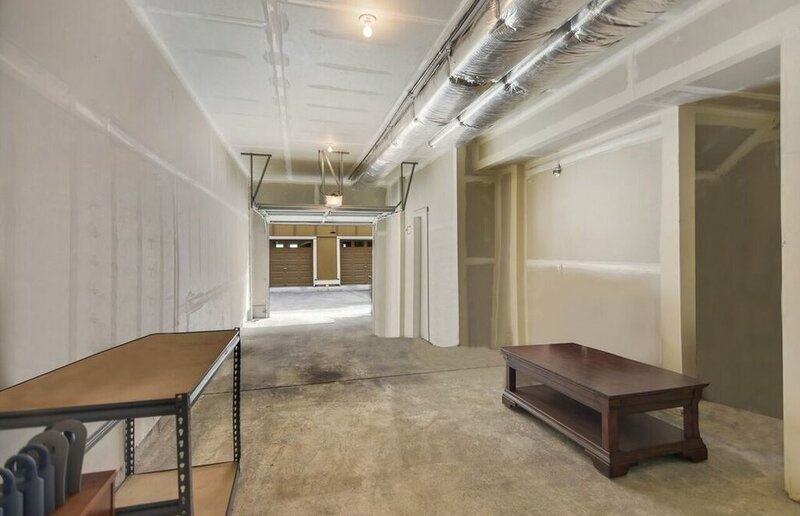 Find a big closet and tall ceilings in this 2nd bedroom. The second top floor full bath. So nice to have another full bathroom in the house! Whenever you're ready to step out into the world, you'll find yourself surrounded with possibilities. Take a look. Colorful, well-constructed, and wonderfully situated! Park 2 cars in the tandem garage, or set up shop space or storage. 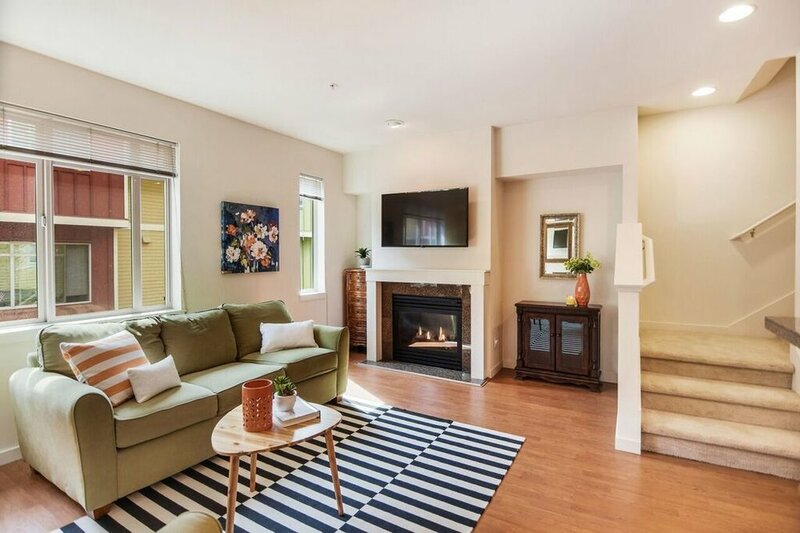 Get anywhere from this townhouse at City Steps! It's even on the bus line (48 & 45) and it's just a 5 minute drive to the Tacoma Dome Station/Park & Ride. The Thursday Broadway Farmer's Market is less than a mile and a half away! Check out walking and driving times to some Tacoma favorites below. You might have noticed Alma Mater on our list above. Just one mile away, this new creative work space, beautiful cafe, amazing show venue, and cocktail lounge is quickly becoming one of Tacoma's favorite spots. Coming soon to the area are the Town Center, just a 5 minute walk away, and the Brewery Blocks, just 8 minutes away on foot. Be part of what's happening in Tacoma's downtown! I'll be hosting an Open House this Sunday, June 24th from 1-3 pm and I'd love to see you. 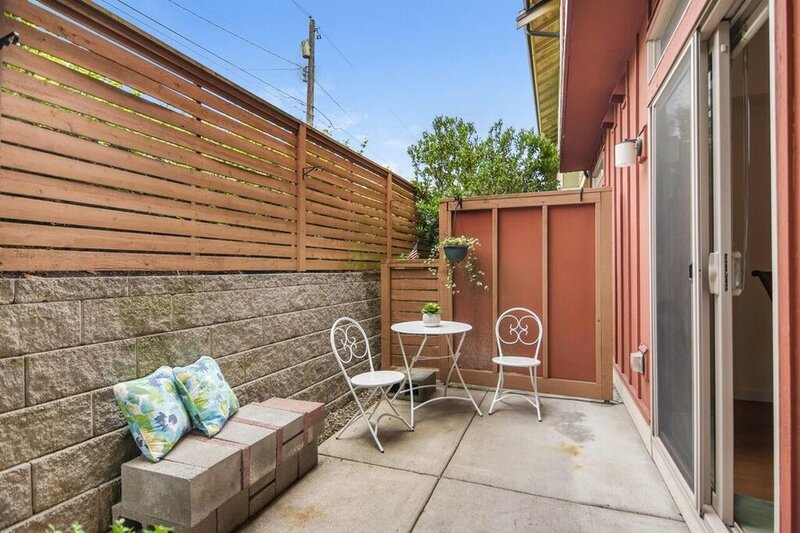 In the meantime, for more information about this Tacoma Townhouse on the slope above Downtown, call or text me at 253-226-2787. I'll be happy to answer your questions about this home or the Tacoma real estate market in general.